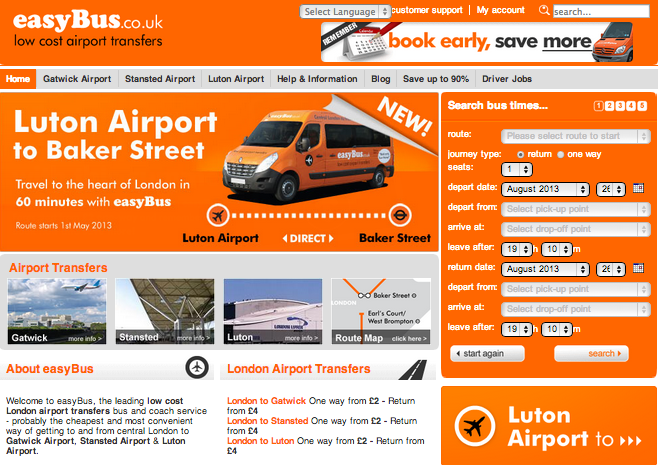 easyBus is easyJet’s 24 hour bus service offering cheap London airport transfers between London and Gatwick, Stansted and Luton airports. There are negative customer reviews on the web mentioning that buses don’t show up and that they charge more for the languages so do a bit of research before booking. While easyBus is definitely one of the cheapest options out there for those looking to get to and from London airports, the numerous complaints against it seem to easily outweigh the price- with extremely late buses, rude staff and almost no chance of getting a reimbursement, easyBus is probably one to avoid unless you don’t have any other option. While you might be saving some pounds with easyBus, the ease, comfort and security of their competitors is worth far more in the long run. Go back to Cheap Bus Tickets category to find more UK providers of bus offers and deals.